It’s Been 5 Years Since the Cronut Debuted — Here’s Every Flavor EverTime flies for pastry hybrids! Momofuku Ssäm Bar Celebrates Its 10th AnniversaryHappy birthday to David Chang’s most impressive eatery. How Pegu Club Forever Changed the Cocktail GameAudrey Saunders’s influential bar opened nearly 10 years ago, and things haven’t been the same since. Il Buco Will Celebrate 20th Anniversary With an Incredible Lineup of Guest ChefsAmanda Freitag and Justin Smillie, too! Suppenkuche Rings In 20 Years With Big Thursday PartyThere will be a special menu, many people, and much beer. The Ferry Plaza Farmers’ Market Turns 20; Patty U. Recalls Its Early DaysThere are birthday celebrations on May 15 and May 18. 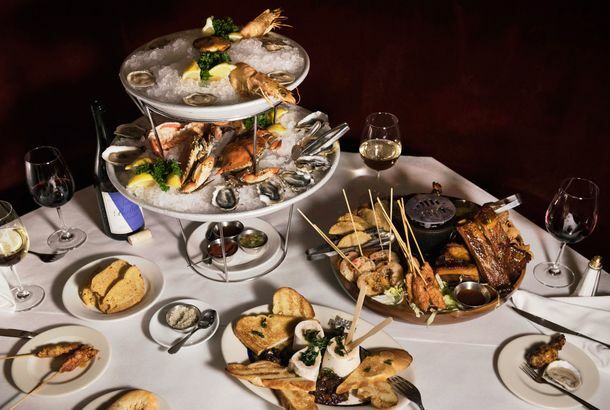 Alioto’s at the Wharf Celebrates Their 88th Birthday With Special MenuIt’s $88 for two. A Decade of Influence: The wd~50 Family TreeIn the ten years since Wylie Dufresne opened his groundbreaking restaurant, his staff has helped redefine New York City’s food landscape. CatHead’s BBQ Celebrates First Anniversary With Party SaturdayThey’re doing a biscuit-eating contest with their “big as a cat’s head” biscuits. Elixir Celebrates Its Ninth Birthday Next Weekend With Pig RoastYes, there will be much pig, and rum. Lizzie Binder, Richard Reddington, Other Alums Return to Jardinière forThe event will benefit Share Our Strength. Renowned Berkeley Wine Importer Kermit Lynch Celebrates 40 Years in BusinessHis store was born in 1972, a year after Chez Panisse. Memphis Minnie’s Rings in Twelve Years; Blue Front Updates Its Menu; andAlso, La Rondalla remains delayed. Jardinière Celebrates Fifteen Years With Revamped Dinner MenuThe menu brings prices for entrees down a touch by making side dishes optional. Actually Pretty Awesome: Lobster Bread Pudding and Smoked Cod at MaverickAlso, it’s the restaurant’s seventh anniversary. Jamie Mammano’s Mistral Turns 15Happy birthday, Mistral. A Castro-Adjacent Beer Garden; Txoko Turns One; and MoreAlso, Starbelly announces their first patio picnic. El Centro Celebrates One Year-O With Free Apps, PartyThe humble little South End cantina has spicy weekend plans for you. Anniversaries This Weekend: Camino, Comstock Saloon, Social KitchenSocial Kitchen is partying until 1 a.m. tonight with a new, anniversary-edition, 8.8% ABV beer. Beer MeTony’s Darts Away celebrates two years with a mini beer fest. Holy Guacamole: Taco Bell Is 50 Years OldEven Grub Street’s editors cop to a few (mostly drunken) favorite indulgences. The Old Clam House Rings In 150 YearsThe place opened the year Lincoln was inaugurated. Clio Rolls Out ‘Classics’ Menu Before Closing for RenovationsGet those tomato water martinis while you still can. Khyber Pass Pub Celebrates It’s First Anniversary TodayIn honor of the first year, they’re serving up food and drink specials all day. Fergie’s Celebrates Its 17th Anniversary TonightThe bar and restaurant celebrates 17 years of operation tonight. Ike’s Giving Away Free Sandwiches In Exchange For TweetsThe giveaway’s only good today. Sandrine’s Turns 15The Harvard Square mainstay is really a teenager now. Twenty Five Lusk Celebrates One Year With Party TonightAlso, they’re doing an anniversary menu all this week. Last Night’s Michael Mina Tribute Dinner, in PicturesThe dinner had a certain nostalgia to it, from plate to plate. 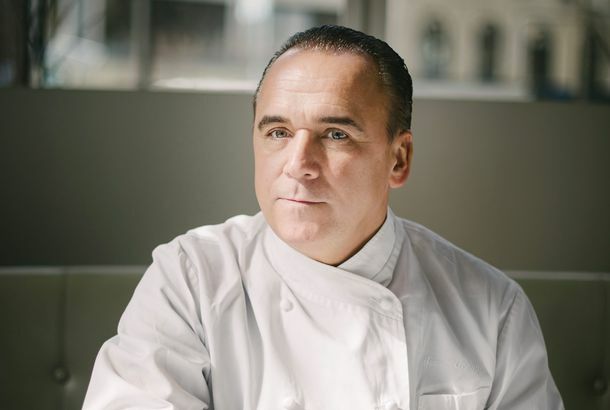 In Praise of Michael Mina’s Many Former Sous ChefsOn Sunday, Michael will be feted by many of the chefs who have worked for him over the years. Michael Bauer Marks 25 Years as ‘Chron’ CriticHe almost didn’t mark the occasion, lest it encourage his detractors… sad. Alums of Michael Mina’s Kitchens Return to Fête Him at October 9The chefs will prepare a six-course menu that pays tribute to Mina’s 20-year career. Three Special Dinners Coming Up: Scala’s 16th Birthday, ForeignAt the Parisian dinner, benefiting Litquake, there’ll be readings by bestselling authors Diane Johnson and Ellen Sussman. Jeremiah Tower Returns, and More Scenes From Chez Panisse’s 40thSetting aside their squabble over who deserves credit for putting Chez Panisse on the map, Tower and Waters kissed, made up, and broke bread for the first time in decades. The Last Chez Panisse/Alice Waters Tribute Piece of the WeekJohn Birdsall’s sort of new angle on the Chez Panisse legacy is a back-handed compliment. The Chron Bows Down Before AliceIn honor of the 40th anniversary week, the ‘Chron’ goes hog-wild with adoring coverage. Alice Waters, Sofia Coppola, Dave Eggers to Hand Out Free Lunches Near UnionAlso, David Byrne will be there, possibly playing music. Chez Panisse Wallpapers the Restaurant With Vintage MenusCheck out a slideshow of the just-installed new wall decor, in honor of this month’s 40th anniversary.